The lack of a ‘fox in the box’ is the main reason why Lancaster City are not a number of places higher in the NPL Premier Division table. That is the view of manager Phil Brown who has been frustrated by his team’s inability to convert their chances in recent weeks. Tom Kilifin’s 90th minute strike to rescue a point against Buxton last night was City’s first goal in four games. Brown is not suggesting that a 20 to 30-goal striker would have propelled his team into a play-off position, but he believes they would be nearer the top end of the table rather than their current position of 18th. “I always knew when we lost Jordan Connerton that we would have to spread the goals around the team this season,” said. “We have done that. We have a group of players who have managed to get around 10 or 12 goals each. Craig Carney’s got 12, Sam Bailey and Tom Kilifin have both got 10, Ryan Winder’s got nine I think. “However, we have not got a kingpin who we can rely on to get us a goal when we’ve needed it. “I think that’s cost us over the season. 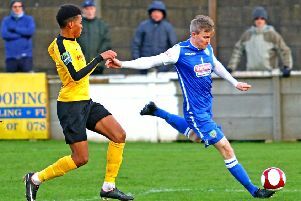 While not content to see his side in the lower reaches of the table with just one game of the season left to play, Brown is pleased overall at the way his men have adapted to life in the Premier Division. “I am really pleased with how competitive we have been,” said Brown, who takes his team to Witton Albion on the final weekend of the campaign. “There’s only been a handful of games where we have been a little bit out of our depth, like Altrincham away and Warrington away. City have a question mark surrounding the fitness of Paul Jarvis (calf) while Charlie Bailey is struggling with a groin strain.